After an enjoyable five-week vacation in the United States, which included Christmas and New Year with family and friends and putting Vicky on a plane to Hawaii for her semester of school, we left Dallas on Sunday, January 11th, 1976, at 2:25 p.m. on a Braniff flight to New York. Our arrival was late, after circling for an hour over Kennedy Airport, then landing in a snow storm, but we caught the bus to the Swiss Air Terminal and made our departing flight at 8 p.m., with 15 minutes to spare. We flew all that night on a DC-10 over the ocean. Once in the air, I had a nice meal, then fell asleep during the movie with the earplugs still in my ear. It was a good movie, too. There was even a small breakfast served, as well, before we landed briefly in Geneva, Switzerland, then flew on to Zurich, arriving about 10:30 a.m. It was cold and a bit overcast, but there was no snow. A taxi driver drove us, like a maniac, to the Hotel Du Theatre, right in the center of town. We got settled in, then walked two blocks to catch a sightseeing bus around the city. We had barely gotten started when, the first thing I knew, Oran was sound asleep. I kept nudging him, but finally gave up and slept half the time myself. I would wake up occasionally, stick my camera out the window and snap something. Except for the pictures, we didn't have too much of an idea what we saw on that tour. To say you’re tired and sleepy after an ocean crossing when you have jet lag is an understatement. After that, we admitted we needed rest, so went back to our hotel to sleep awhile. Refreshed, we started out again, walking in the area of our hotel and found a very interesting small street, closed to traffic, with nothing but small bars and eating places. The drinks turned out to be very expensive in the first bar we went into, plus there was no action, so after finishing one round, we walked on down the small street to another, more enticing looking, local place. That one was a winner. We sat on stools at the bar, drinking wine and soon made friends with one particularly good-looking German guy, who could speak English. He had a beautiful voice, as well, and was soon singing "Beer Barrel Polka" and other German songs to us. We talked to others at the bar as well, sang, and danced for several hours. We finally picked ourselves up and walked several blocks before finding an open restaurant as it was so late. After a meal of hearty stew and salad, we walked back to our hotel to bed. It had turned out to be a delightful and enlightening evening. The flight on to Saudi Arabia the next day, Tuesday, January 13th, was a good one too. After breakfast in our hotel, we took another taxi to the airport, caught another Swiss Airplane (a smaller DC-8 this time), and departed Zurich at 11:00 a.m. Besides the beautiful weather, we enjoyed a delicious meal of lobster tail and steak before landing in Athens, Greece, to refuel, let some passengers off, and pick up others. Several hours later, we landed at the Dhahran International Airport in Saudi Arabia again at 9:30 p.m., went through customs and were in our apartment in Abqaiq by 11:30 p.m. It had been a good trip all the way. Tuesday turned out to be a good day for Oran to return to Arabia after a trip, as the next day, Wednesday, was the last working day of the week. As he actually worked in 'Udhailiyah, he was not expected to fly down there that day and return to Abqaiq for the weekend, after such a long, exhausting trip. He called the office in 'Udhailiyah to report that he had returned to the Kingdom, and talked to Ahmed and Abdullah, who worked in the office there. We had eaten breakfast and started our unpacking when Chris and Marge DeSantis stopped by to welcome us back and invite us to dinner that evening. Then Oran took our passports back to the Passport Office and took care of other errands, as he would be out of camp all the next week. There were always so many things that had to be taken care of the first day back from repatriation. We also telephoned our friends Pat and Guy Smyth and Jeanine and Jerry King. After dinner at the DeSantis' that evening, we went by Kings, who had asked us over to tell us the details of their son, Jimmy, being in jail. That had been a shock to hear, as the Arab who abducted him had been caught and had confessed. But at the trial he accused Jim of trying to buy drugs from him, as well. So, according to the strange laws of the Kingdom of Saudi Arabia, guilty until proven innocent, Jim also had to be punished. He was sentenced to serve one month in jail and had been there for 16 days already, but it wasn't turning out as badly as they had feared. He was put in the jail facility between Abqaiq and Madinat, in a separate room from the other prisoners, and was allowed to go out into a courtyard with a guard. He was allowed to take a television set and his record player with him and could use the telephone occasionally. His father and other men could visit him daily, as well as the kids from school, both boys and girls. But his mother just got to go twice a week, which was understandably upsetting to Jeanine. Jim was an outgoing, personable young man, so he made the most of it, making friends with the Arab guards, even learning to speak Arabic. The kids from school even started treating Jim like a hero, so that helped. Jeanine and Jerry took it hard at first, but had pretty much accepted it by the time we got back from our trip. But they were still trying to decide just what they would do when they went back to the States on their vacation. After our discussion about Jim, we went with them to a party at Peg and Pat Morrison’s, so we didn't get home that night until around midnight. As usual, with jet lag, we woke up in the wee hours of the morning and couldn't go back to sleep for a long time. When we finally did, we slept until 2:30 the next afternoon. After breakfast, Oran went to the Post Office and brought back not only the mail, but Marge and Marvin Williams and Shelia Kaul, so we visited awhile with them about our vacation and what had happened in Abqaiq while we had been gone. After that, Oran and I walked to the suqs because the Commissary had closed while we were still asleep. That evening we went to the Dining Hall for dinner, then to the Williams for drinks and more visiting. Friday morning we only slept until 10:30. After breakfast, Oran worked on his wardrobe for the winter months, then we went to the DeSantis' to play bridge for awhile. Later, Oran and Marvin went with Jerry to visit Jim in jail, while Jeanine, Marge and I visited some more. That evening we just relaxed at home by ourselves, reading more of our accumulated mail and papers, having homemade wine, and a barbecue rib dinner. It had been extremely nice for Oran to have the three days off just after we got back, so we could rest and visit with all our friends, before starting back into the normal routine. The weather was now pleasant and cool, with temperatures ranging from 49 to 70 degrees, nice for sweaters or light jackets. We had been told there was a lot of rain while we were gone. The next morning, Saturday, January 17th, 1976, Oran finally flew back to 'Udhailiyah for the work week. I rested a lot (do you get the idea that our trip was tiring? ), did various routine things daily, such as: writing letters to everyone back home, getting my check-up at the Clinic, visiting more with Jeanine and Jerry and other friends. Monday morning I had coffee with Kathi Steindorf (who was also back from vacation), Caroline Dupree, and Sandy Adams. We showed our pictures and talked about our vacations. Oran came home again Tuesday afternoon, one night early to prepare for weekend duty in 'Udhailiyah. He would be Weekend Foreman for the next month. While we were having wine on our porch, the DeSantises joined us there, then took Oran back to their house for a spaghetti supper while I went to bowl. We had been invited to Adams house for drinks the next evening before going to the dance at the Golf Club House with the group, but Sharon Morris called to say that she and Jim were back in Abqaiq and asked if they could stay with us for a couple of nights. After they arrived, we had drinks and dinner before we all got ready for the evening's activities. We altered our plans a bit by going by Jeff Schnell’s, friends of the Morris’ for drinks before going on to the dance. We did sit with our group, though, and Morris' visited with a lot of their friends, and everyone had a good time. Their trip to Abqaiq had been unexpected, but we enjoyed seeing and being with them again. It was tough on Oran, but he had to fly on back to 'Udhailiyah the next morning, Thursday. Jim went to the Sante Fe office in Abqaiq as well, so Sharon and I slept late, had coffee and toast, then went to the Post Office and Commissary. She seemed to be enjoying the regular camp routine again. After a lunch with the Schnells, we picked up some Arabic lessons for Sharon and visited with the Casswells. Later we had wine and cheese on our porch with Elaine Swisher from next door until Jim came home. After dinner, we went to the movie, "Breakout". Jim went to play golf Friday morning while Sharon worked on Arabic lessons. I fixed us all a sandwich for lunch before Jim went back to the office to do some more work. Then Sharon helped me select the correct length for the new pants I had bought in the States. Jeanine and Jerry came by to visit and we went back to their house to get some patterns for Sharon to take back to Abu Dhabi. 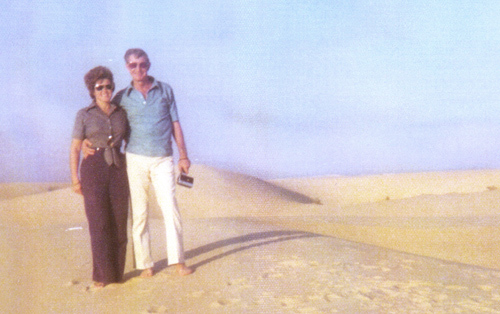 When Jim got finished at the office he and Sharon went to the Elkin’s house to spend the rest of their time in Saudi Arabia during this trip. I talked to Oran on the phone, before going to Williams for dinner with the Foremen and wives’ group. We took pictures and had a very good time. The group seemed to get along well and enjoy each others company. The first part of the next week it was rainy. Oran came home Sunday evening for his days off. The next day, January 26th, was Jeanine King's birthday, so we invited them to dinner. I fixed shrimp cocktail, spaghetti and meat sauce and french bread. That was enjoyable, and Jeanine got an especially nice birthday present a couple of days later. Their son, Jim, got out of jail at 8:00 a.m. Wednesday, January 28th, after serving his 30 day sentence. Both Jeanine and Jerry were very happy about that. Oran flew back to 'Udhailiyah that same morning to start his weekend duty. I finished a book and wrote some letters, then took them to the Post Office right away. That evening a Doe Wilson called to say she had received a letter of ours from Desda and Bill Hale. So the Post Office were still getting our letters mixed up. The next morning, I walked to Doe Wilson's to pick up the letter. At least I was getting to meet the other Wilsons in camp. That evening, the Kings had me over for dinner. On Saturday, we received a letter from Sharon Morris thanking us for our hospitality the weekend before when they were in Saudi Arabia. She also had a surprise announcement that they would be going back to the States for 6 months on February 15th. They would be in Newport Beach, California, the home office for Sante Fe. The company would ship everything of theirs to the next Middle East destination, probably Bahrain, or back to the States. Sharon was going to Cairo the next day to sort through things, and decide where she wanted what. They hoped to hear about their original shipment, which went to Beirut. An office had been opened there again, and a telex had been sent by the company, telling them to either locate their stuff, or confirm its destruction. That evening, Marge Williams and I met Kathi and Sandy at the Dining Hall to eat, then went back to my apartment to play bridge and visit. We finally had all four husbands in 'Udhailiyah again on the same night.